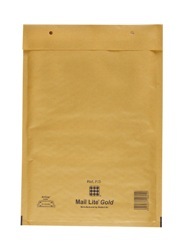 For added protection when mailing important items. Lightweight bags for outstanding product protection. A/000 size is ideal for jewellery, watches etc. 10 + boxes - £5.39 per box. F/3 size is ideal for desk diaries, software etc. 10 + boxes - £6.69 per box. B/00 size is ideal for floppy disks and small items. G/4 size is ideal for A4 size items, brochures, literature etc. C/0 size is ideal for CDs and small items.